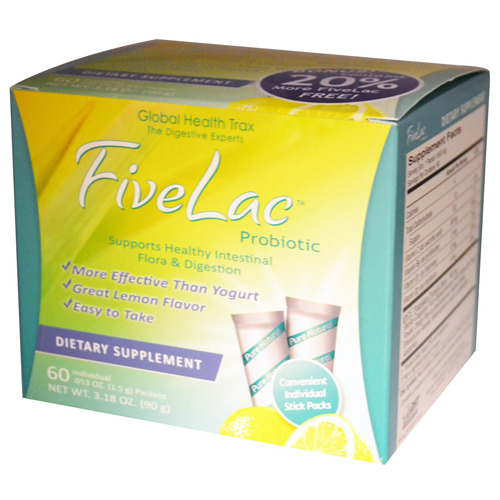 What sets FiveLac apart from other probiotics is the technology used to keep the friendly bacteria alive. 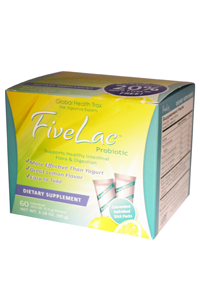 FiveLac gets live bacteria safely past the acids in the stomach and into your intestinal tract where it does its work. The strains of friendly bacteria in FiveLac were specifically chosen for their unique ability to survive the gastric juices in your stomach and remain alive once they reach your digestive tract. The secret to FiveLac's stable shelf life is its specialized manufacturing process which prevents moisture from reaching the product during production, and the packaging is designed to keep the moisture out. Refined dry yeast powder and fructo-oligosaccharides (FOS) are both included in FiveLac to help feed the friendly bacteria in the stick pack as well as help feed them once they reach your intestinal tract. Adults and children take one to two packets a day to start. Empty the packet contents into your mouth and follow with a few ounces of water, or add powder to a few ounces of water and drink. If additional support is desired, you may build gradually to a higher number of packets. Amount needed may vary from person to person. Packets may be taken any time of day, with or without meals. Beta cyclodextrin, erythritol, lemon juice powder, silica, canola oil. Contains a maximum of 30 ppm casein (an ingredient derived from milk). Keep out of reach of children. Do not use if packet is torn or damaged. Do not take while taking antibiotics. Pregnant or nursing mothers, if under medical care, or if you have a suppressed immune system, consult your health practitioner prior to use. † Percent Daily Value (DV) not established. †† Not a significant source of sugar.